22-year-old Tanjit Pathak enjoys the challenge of running three machines simultaneously in the Tamul Plates factory, where he and five others race against time, turning palm leaves into disposable dinnerware. On most days, he can produce near 1,200 pieces, usually pulling two plates and a bowl out of a single palm leaf. His boss, founder Arindam Dasgupta, says proudly that Tanjit “is one of our best workers.” Because quality matters as much as quantity, Tanjit has to be on his game all day, working quickly. He dances in a choreograph of placing a palm leaf onto a heating-mold machine, filling the other two machines with more leaves while the first one processes, and then circling back again to remove shaped bowls and plates, and then start the process again. When Tanjit graduated from high school, he had no desire to continue on to college. Jobs are scarce in the rural northeast of India, where he lives in Assam. According to Arindam, for every one job posted, you will get 1,000 applicants—200 of whom are serious about and qualified for the work. All Tanjit wanted was to make a decent wage, enough to help support his mother, father, and two younger sisters—with whom he still lives, as is common practice for young adults in India—and have a little left over for clothes, parties, and his mobile phone bill. He gives 60% of his earnings to his family and keeps 40% for himself. 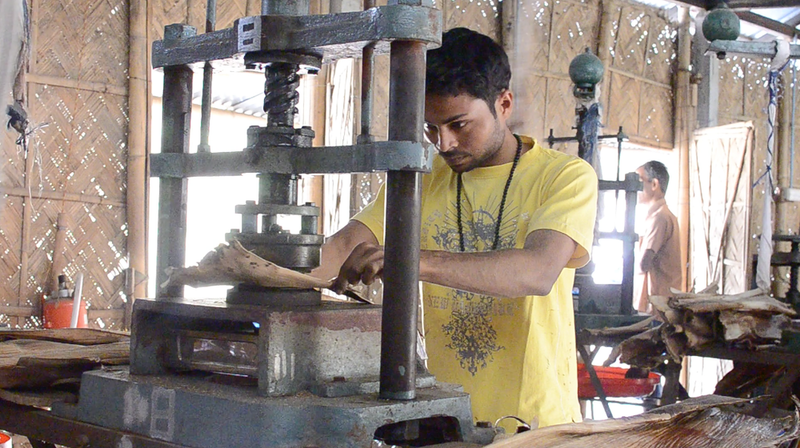 Tanjit (center) prepares an arecanut leaf sheath for pressing on the heated mold. Tanjit felt lucky to land an entry-level job with Tamul as a leaf washer, at age 17. Making biodegradable dinnerware takes a village - literally. Many local families collect leaves from the arecanut palm tree that grows here. They sell to leaf-collection agents for a few rupees each, and then the leaf agents supply Tamul with raw material that will become plates and bowls. Once at the factory, the leaves undergo a careful process of drying, sorting, and storing. Just prior to becoming dinnerware, they are thoroughly scrubbed clean. That was Tanjit’s job; but that didn’t last long. He was promoted just six months later, given one machine on which to learn how to make product. He soon graduated to three. It takes time to perfect the skills involved with efficiency of movement and material. Pressing the leaves is a bit like pressing cookies with cookie cutters, as the machines cut and press a portion of the leaf into a plate and you want to have as much leaf left over as possible for the next plate. You must know the precise moment when to lift the heated mold, when the plate is cured but not burnt, and you must know how to get clean edges. Only the units fit for sale count in one’s daily output. Rejects do get used, though: They feed the fires that dry new leaf inputs. For Tanjit, however, it’s the pile of perfect products that makes him smile. Starting work at 6:00am, Tanjit and his coworkers arrive to begin heating up the machines, which are ready to begin pressing leaves by 6:45am. Breaking only for lunch, they work until 2:00pm, when they count their units and clean up their area; then they are finished for the day. Wearing a yellow T-shirt with a logo from an American rock band and a shock of dark hair neatly gelled, Tanjit says he still has no interest in going to college or getting married. His slender, blue-nail-polished hands fly from machine to machine. He says he’s very happy with this job. Arindam comments, when Tanjit is out of earshot, “He is mild person and a good worker. He doesn't get into others' business. Other youth don't contribute to the family income the way Tanjit does.” Arindam, known in the industry as an honest man with a social mission, has made a commitment to hiring as many women and youth as possible for Tamul. He explains why. “Many of our youth have a drinking problem,” he says, “but if they're busy like this, it keeps them out of trouble.” That is, you wouldn't want to come to work at 6am hung over. Tanjit has way too much to do for all that. As Tamul has expanded, they’ve added home-production units to their fleet of leaf-pressing machines. This allows regional families to rent or purchase the same type of dryers and pressers used at the Tamul factory in smaller, home-based businesses that employ family members or neighbors. When Tamul made their first sale to a home business in a village on the banks of the Manas River, Tanjit was chosen to accompany the factory manager to drive the machine to its new location, install it, and stay for one week to train the new crew in the tricks of the trade. “I really enjoyed that,” Tanjit says. “I hope the company continues to grow, so that I can travel more and do more trainings.” He’d like to start with Mumbai and Delhi, big cities in India that are no more than magical-sounding names to him now. But at 22, he’s already left the small village where he’d spent his whole life. For a humble leaf-washer who’s become one of the fastest and most skilled production workers at Tamul, that’s quite a promotion. Older PostThoughts on GIIN's "Impact Measurement (IM) and Performance Management Training"